So far, I have been spending this year really trying to go through and use up the products that I already have instead of buying new ones. Surprisingly, I have been going rather well! There have been sooo many great products that have been released in Australia over the past few months but will jump on the bandwagon for these later on in the year. In this Empties blog, I would like to share with you my latest batch of products used up and reviews on the products that I have not mentioned in my previous empties post! QV Gentle Cleanser: This is a very soft facial cleanser that doesn’t make your face feel tight or stripped of moisture in the least. The QV products are created for individuals who have sensitive skin. I did enjoy this product but did find that after cleansing my face twice – I would still have traces of makeup on my face. I probably would not re-purchase due to this. Rimmel Stay Matte foundation: This foundation was okay. The colour wasn’t perfect as there isn’t a big colour range and this foundation didn’t keep me matte all day. This isn’t something that I would re-purchase as it seemed that this foundation just coated my skin in colour but didn’t actually provide any coverage. Rimmel Scandel Eyes mascara: I did enjoy this mascara! This is one of those products that I used just to finish off my mascara look. If you like natural and minimal mascara looks then I would stay away from this product. The consistency of the mascara was quite thick and I did find that this lasted longer than other mascaras. I wouldn’t re-purchase just because I am not really a fan of the ‘spider legs’ mascara look anymore. Maybelline Colossal mascara: I absolutely love Maybelline mascaras and this product was no exception. I would definitely re-purchase but since it seems that Maybelline are constantly releasing new mascaras – I may not have to as I love picking up new ones! I would recommend this product! Great for last separation, building length and volume – all what you would expect from a great product. Revlon ColorStay eyeliner: There are some Revlon products that I continue to re-purchase over and over and then there are ‘hit and miss’ products. For me, this was a hit and miss product. I am not too sure if I just picked up a bad one but I found the consistency of this product to be quite watery and the colour wasn’t very dark. I will not re-purchase. Revlon Photoready primer: I really love this product and this is my second or third bottle that I have gone through. It is a creamy primer that doesn’t feel overwhelmingly ‘siliconey’. I do like silicone based primers but sometimes they can feel a little drying on the skin if you have washed your face right before putting on make-up. I will definitely re-purchase as it is one of my favourite primers! Loreal Base Maquique primer: This is another product that I really did enjoy and found it to be a great drugstore primer. This one did have more of that ‘silicone’ feeling but I didn not find this product to be drying at all. I would re-purchase this product but find that there are just so many primers to try! Nivea Repair and Protect lip balm: This has probably been my favourite Nivea lip balm purchase to date! I found that the product actually sunk in and provided hydration and didn’t just coat my lips in a gloss. I love these products because they are so affordable, are constantly on sale and actually hydrate my lips. I would repurchase but already have a bunch of lip balms right now – I wouldn’t’ need to! Maybelline Fit Me Powder: I love this product and have a few of these – all in different shades. It is the perfect powder to just throw in your bag and touch up during the day. I do find that this product has SOME shimmer in it but it doesn’t make my face look shimmery or glittery at all – and I have oily skin! These products last forever and I will definitely continue to re-purchase. Johnsons Facial Wipes: These wipes are products that I have been re-purchasing for years. However, this is the first packet that I have gone through of the ‘oil balancing’ wipes. I didn’t mind this product but would not re-purchase this particular one. On the other hand, the ‘refreshing’ wipes in the pink packet – I will definitely continue to re-purchase. These do not dry out your skin, irritate my eyes and are so affordable – I always pick them up on sale! 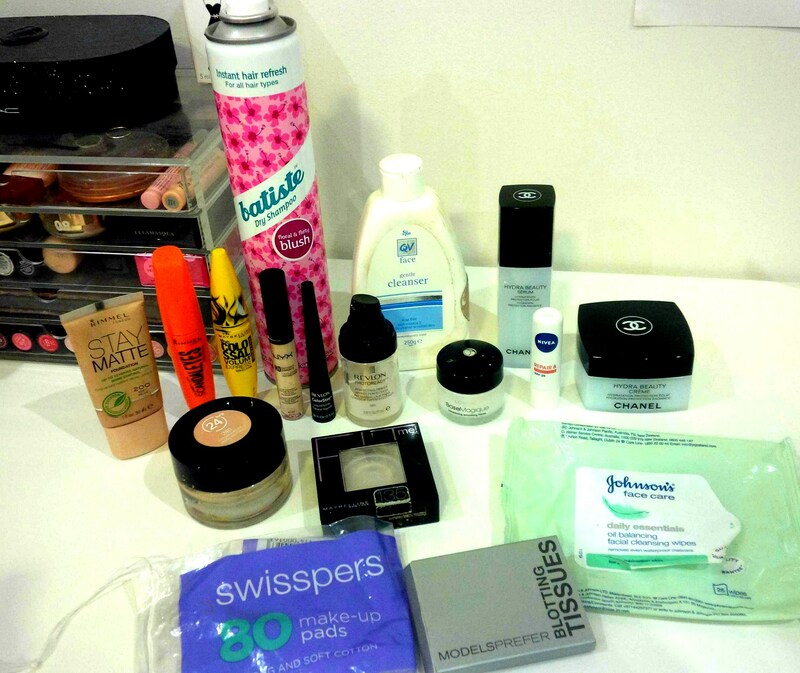 Previously mentioned products: Batiste dry shampoo, Revlon foundation, Models Prefer blotting papers and Swisspers make-up pads.